The name of the rocket mission is AZURE–short for Auroral Zone Upwelling Rocket Experiment. Its goal is to measure winds and currents in the ionosphere, a electrically-charged layer of the Earth’s atmosphere where auroras appear. 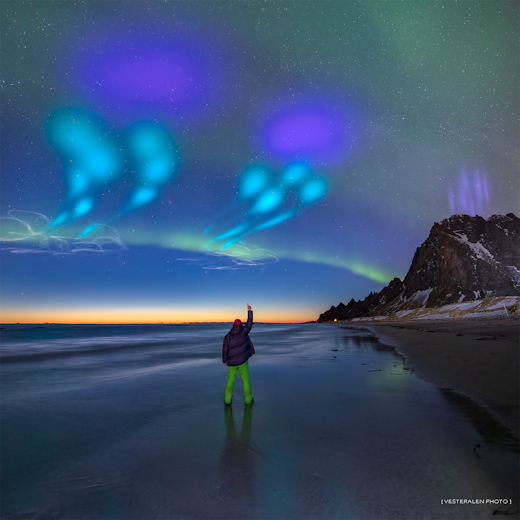 Specifically, mission scientist are interested in discovering how auroral energy might percolate down toward Earth to influence the lower atmosphere. The twin rockets deployed two chemical tracers: trimethyl aluminum (TMA) and a barium/strontium mixture. These mixtures create colorful clouds that allow researchers to visually track the flow of neutral and charged particles, respectively. According to NASA, which funded the mission, the chemicals pose no hazard to residents in the region.